Lima, Peru, Jan 21, 2018 / 08:49 am (CNA/EWTN News).- Speaking to contemplative women religious Sunday, Pope Francis said that they aren’t second-class, but a necessary part of the Church, and asked them to continue to pray on behalf of the Church and sinners. “Sisters, know something: The Church doesn’t tolerate you, it needs you!” the Pope said in off-the-cuff remarks Jan. 21. Pope Francis spoke during a homily at the end of praying “Terce,” the prayer of the Liturgy of the Hours sung or said at 9a.m., with contemplative women religious in Lima’s Shrine of the Lord of Miracles. The prayer took place on the last day of his Jan. 18-22 apostolic visit to Peru, which followed a three-day visit to Chile. He will return to Rome Jan. 22. Following his meeting with women religious, Pope Francis made a stop at the Cathedral of Lima to pray in front of relics of five Peruvian saints. “Our Archdiocesan Church has been made fruitful by the apostolic labors of Saint Turibius of Mogrovejo, enlarged by the prayer, penance and charity of Saint Rose of Lima and Saint Martin de Porres, adorned by the missionary zeal of Saint Francisco Solano and the humble service of Saint Juan Macías,” he prayed. After the prayer and benediction, Francis met with the bishops of Peru in the chapel of Lima’s chancery. In his speech to bishops he focused on the 16th century saint from Spain, St. Turibius of Mogrovejo, who served as the archbishop of Lima for 25 years, and is known for having upheld the rights of Peru’s indigenous peoples. He was canonized in 1726, making him one of the first canonized saints of the Americas. During his time as archbishop, Turibius made three different visitations to the land of his diocese, crossing rugged and dangerous terrain. “He went out to encounter everyone, along paths that, in the words of his secretary, were meant more for goats than for people,” Francis said. The Pope noted that when St. Turibius was visiting and living with his people he learned to speak their languages so that they could really understand the Gospel, and it could touch their hearts. This is a good lesson for bishops of the 21st century too, he pointed out, who not only sometimes need to learn new languages in the traditional sense, but also to learn the language of the digital age, in order to communicate well with young people, families and children. At the end of the meeting, the Pope also held a lengthy question-and-answer session with the bishops. 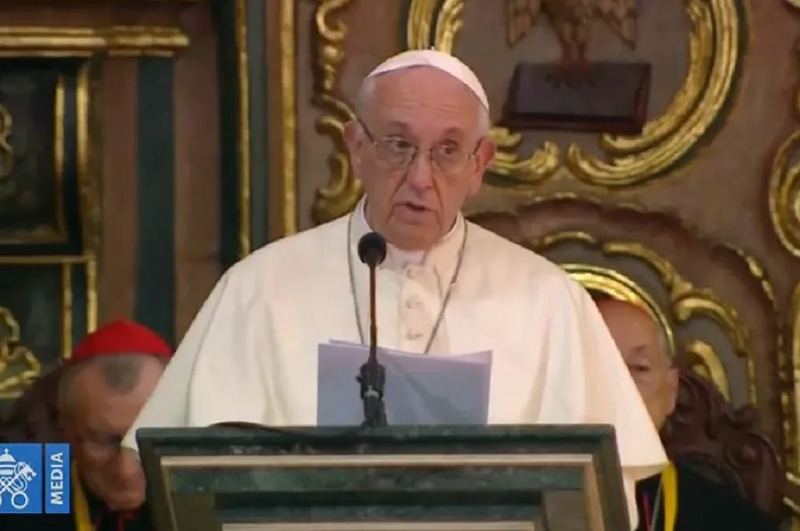 Villavicencio, Colombia, Sep 8, 2017 / 03:46 pm (CNA/EWTN News).- Pope Francis told the Colombian people Friday that while it will be challenging, they must let go the anger caused by years of painful suffering and break the cycle of violence through a process of genuine forgiveness. Pope Francis spoke during a prayer gathering in Villavicencio for national reconciliation as part of his Sept. 6-11 visit to Colombia. The trip, which marks his third tour of South America since his election, is largely the result of the country’s ongoing peace process between the government and Colombia’s largest guerrilla group, the Revolutionary Armed Forces of Colombia (FARC). After more than six decades of conflict, a peace deal was finally struck in August 2016, de-escalating a conflict which since 1964 has left some 260,000 people dead and an estimated 7 million displaced. Archbishop Oscar Urbina Ortega of Villavicencio greeted the Pope, offering his own brief reflection on the need for reconciliation. Reconciliation among the Colombian people “is a process, not only a goal or a perfect state,” Archbishop Urbina said, pointing to the strong desire of Colombians to overcome the pain caused by different forms of violence such as kidnapping, extortion, displacement, forced disappearance, forced recruitment, threats against life, and murders. These, he said, “have destroyed projects of life from thousands of families and communities,” and it will take time to help so many people rebuild their lives. 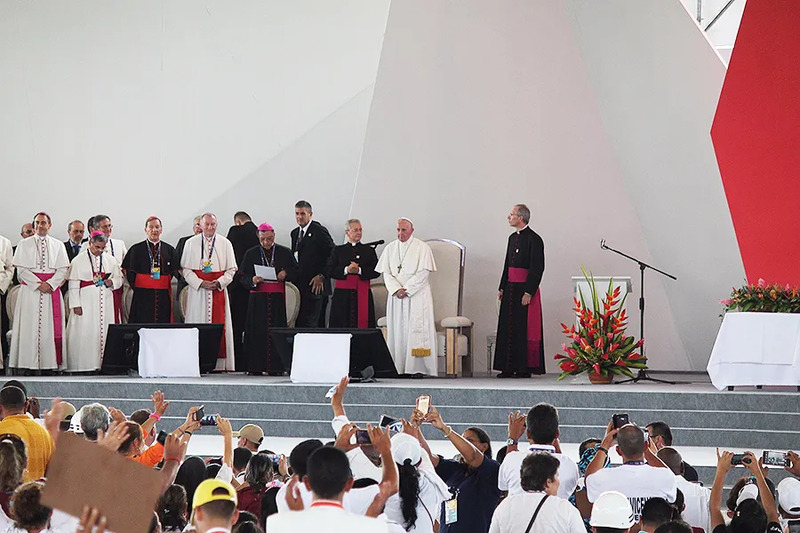 Pope Francis then listened to four testimonies from victims of the violence, including former FARC fighters and former members of other paramilitary groups. The first testimony was given by Juan Carlos Murcia Perdomo, who was part of FARC forces for 12 years, and reflected on truth. After being recruited at 16, he lost his left had working with explosives. He eventually ascended the ranks and was named commander of his own squad. However, Murcia said at the same time he felt used and had a strong sense of nostalgia for home, and little by little understood that violence wasn’t the right path. He left FARC and later launched the “Funddrras Foundation,” which is dedicated to sports in a bid to offer youth an alternative to drugs and violence. Deisy Sanchez Rey, who at 16 was recruited by her brother to join the United Self-Defense Forces of Colombia (AUC) paramilitary and drug trafficking group, spoke on justice. She shared her story of how she was eventually arrested and, after two years in prison, wanted to change her life. She began attending Mass and studying psychology, and now offers counseling to victims of drugs and violence. A third testimony, given by Luz Dary Landazury, the victim of an explosion set off by guerrilla forces, regarded mercy. In addition to nearly losing her left leg and suffering wounds all over her body, Landazury’s 7-month-old daughter also suffered significant injuries to her face. Despite her anger, Landazury said she eventually understood that hate would only lead to more violence, and so began visiting other victims in order to help them learn to let go of their own anger and move forward with their lives. The final testimony, focused on peace, was given by Pastora Mira Garcia, whose father was killed by guerrillas when she was just 6-years-old. She also lost her first husband, her daughter, and her son to guerrilla violence. However, with what she describes as grace and the help of Our Lady, she was able not only to work with other families who had experienced similar losses, but eventually, in different moments, met and cared for both her father’s killer, who was sick and abandoned, and her son’s murderer, who was wounded. “You carry in your hearts and your flesh the signs of the recent, living memory of your people which is marked by tragic events, but also filled with heroic acts, great humanity, and the noble spiritual values of faith and hope,” he said. He pointed to the Crucifix of Bojayá, where on May 2, 2002, 119 civilians, including 45 children, were killed by guerrilla forces in an effort to take the Atrato River region from the AUC. Victims had taken refuge in the town’s church, but were all killed when the militants began launching gas cylinder bombs inside. 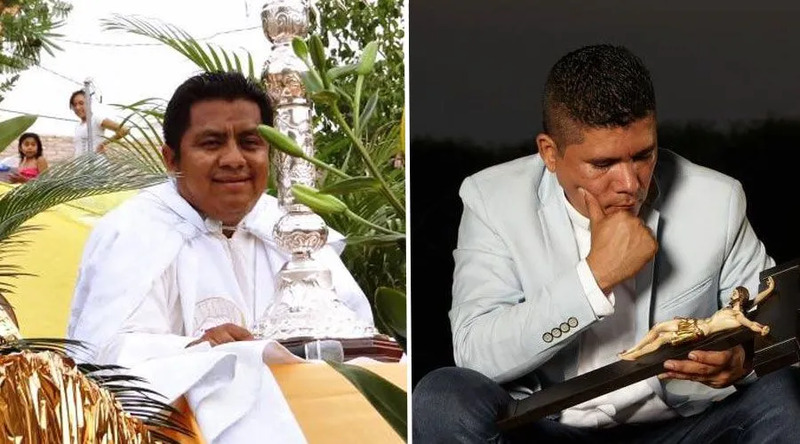 Turning to Deisy and Juan Carlos, the former FARC and AUC fighters, Pope Francis said their testimony helps one to understand that they, too, are victims. Francis recognized that it might be hard to believe change is possible given the sheer amount of suffering and violence perpetrated by those pursuing their own agenda. However, “even when conflicts, violence and feelings of vengeance remain, may we not prevent justice and mercy from embracing Colombia’s painful history,” he said. “Do not be afraid of asking for forgiveness and offering it. Do not resist that reconciliation which allows you to draw near and encounter one another as brothers and sisters, and surmount enmity,” he said. Francis then led attendees in a prayer for peace to the “Christ of Bojayá,” in “Lord, make me an instrument of your peace,” a 20th century prayer which is often attributed to St. Francis of Assisi, and in the Hail Mary. Before departing, the Pope blessed all present.